Shortly after Reuben Fleet sold his interest in Consolidated Aircraft Corporation in March 1943and the company was reorganised as Consolidated Vultee (Convair), the US Navy expressed interest in a new long-range multi-role flying-boat. 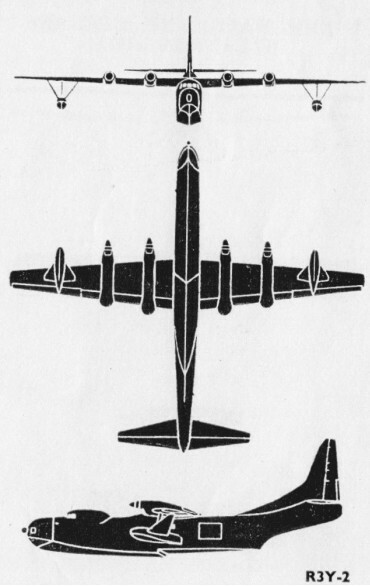 Convair's proposal was for an aircraft powered by four turboprop engines, was the subject of a contract for two prototypes, awarded on 27 May 1946. Designated XP5Y-1, the new aircraft featured a slim fuselage for an aircraft of this class with a length-to-beam ratio of 10 to 1. it was powered by four Allison T40-A4 turboprops, each driving two contra-rotating, reversable propellers through a common gearbox. The type's main role was anti-submarine warfare, and it was to have been fitted with advanced radar, ECM and MAD equipment in addition to carrying a heavy load of bombs, mines, rockets and torpedoes. The first aircraft was flown from San Diego on 18 April 1950, and in August the type set a turboprop endurance record of 8 hours 6 minutes. August was an eventful month for the XP5Y-1 as the US Navy decided to discontinue its development for maritime patrol, but to persevere with the basic design for use as a passenger and cargo aircraft. Work continued, despite the loss of an XP5Y-1 in a non-fatal crash off San Diego in 15 July 1953 and the first R3Y-1 Tradewind flew on 25 February 1954. Major changes included the deletion of all armament and of tailplane dihedral, the addition of a 3.05m wide port-side cargo hatch aft of the wing and the provision of redesigned engine nacelles to accept the improved T40-A-10 engines. Cabin sound-proofing and air-conditioning were installed and pressurised accommodation provided for up to 103 passengers or, in medevac configuration, for 72 stretcher cases and 12 attendants; cargo payload was 24.4 tonnes (24 tons). 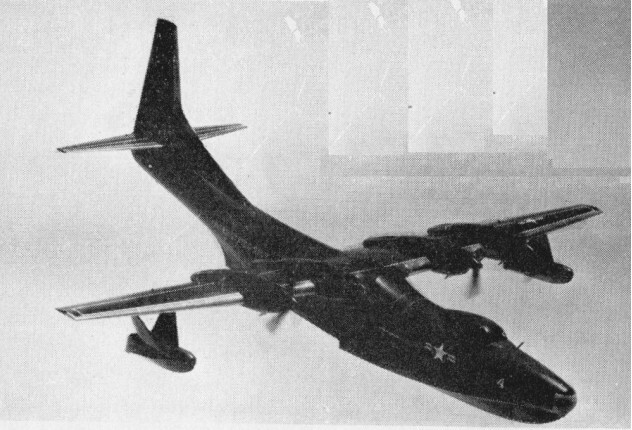 The R3Y-1 was a straight transport version, the R3Y-2 was the assault transport version with the hinged nose. It could also refuel jets in flight using two or four wing pods. The R3Y-2 had a nose loading door and integral hydraulic ramps. 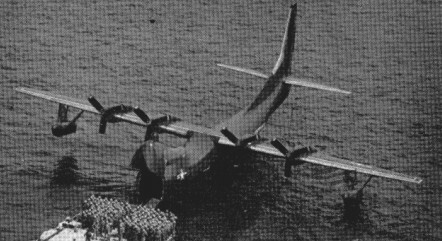 The opening door blocked the pilots' forward view during beach operations. The R3Y-1 's performance was demonstrated on 24 February 1955 when one of the five aircraft built flew coast-to-coast at an average speed of 649km/h on delivery to the Navy Test Center at Patuxent River, Maryland. Similarly, on 18 October a 6 hour 45 minute record flight at an average 579km/h was accomplished between Honolulu and NAS Alameda, California. US Navy transport squadron VR-2 received the first of its mixed fleet of R3Y-1 and R3Y-2 flying-boats on 31 March 1956, but financial considerations and continuing problems with the engine/propeller combination, culminating in two in-flight separations of propellers and gearbox from an engine (on 10 May 1957 and on 2 January 1958), led to a curtailment of Tradewind operations. Squadron strength was first cut to two R3Y-1s and two R3Y-2s and the unit was finally disbanded on 16 April 1958. Passenger Capacity: 80 or 24 ton. Engines: 4x 5,500 h.p. Allison T40-A-4 coupled turboprops. Accommodation: 103 troops, 92 stretchers and 12 attendants or 24 tons of cargo.